The ability to move your hand and fingers depends on the median nerve that runs through a tunnel from your hand to your forearm. Tendons that connect muscle to bone make it possible to move your fingers. Overuse may cause the membrane covering these tendons to become inflamed. When this happens, the membrane swells in the carpal tunnel, resulting in pain, tingling, loss of dexterity, and a feeling of weakness. At the law offices of The Orlow Firm, we help office workers, clerks, cashiers, and factory workers suffering from carpal tunnel syndrome. Our lawyers regularly work with physical therapists, neurologists, and occupational health and safety experts in establishing the extent and degree of our client’s condition. 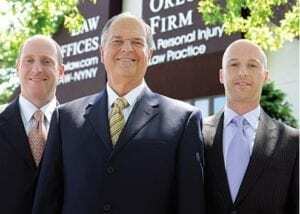 If repetitive motion as resulted in tingling, numbness, pain, and weakness in your arm and hands, contact the carpal tunnel syndrome lawyers at The Orlow Firm today to schedule a free consultation. Call (646) 647-3398 or contact us online. In many cases, carpal tunnel syndrome requires endoscopic surgery. When pain, numbness, and weakness become chronic, removing tissue in the carpal tunnel itself creates more room for the nerve and tendons affected. After surgery, recovery typically takes a number of weeks before the hand and fingers can be used again. During this time, medical and wage benefits should cover most of your costs. However, employers may try to argue your condition is due to a pre-existing condition and thus not job-related. Our attorneys work with medical experts who document your condition, its relationship to your job functions, and can respond to medical claims made by an employer’s insurer. We’re prepared for the kind of tactics used by both to avoid paying a claim related to carpal tunnel syndrome. If left untreated, carpal tunnel syndrome can lead to loss of muscle use in the affected hand. Don’t let an employer intimidate you into thinking you have to “tough it out” or “work through it.” To schedule a free consultation to learn how we can help you, call (646) 647-3398 or contact Brooklyn carpal tunnel syndrome attorneys at The Orlow Firm online.